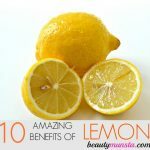 20 Beauty Benefits of Lemon for Skin, Hair & More - beautymunsta - free natural beauty hacks and more! Hey guys! 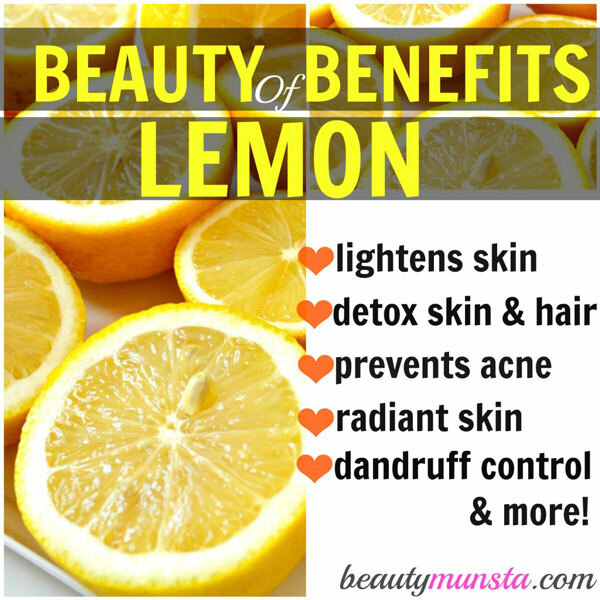 Be amazed to read 20 amazing beauty benefits of lemon for skin, hair, nails and more! Where exactly the world’s first lemon tree grew remains a mystery till today. Some sources say the first lemons came from a region in North-eastern India, Northern Burma and China. Others note that the first lemon tree was traced back to Egypt. Wherever they came from, lemons have always been a top secret beauty ingredient used by women from all over the world – ancient Greece, India, China and the Arabian Peninsula. 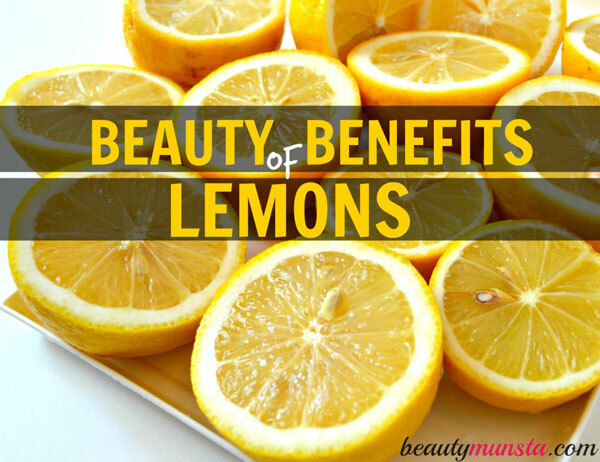 Now these secrets are revealed to you through these 20 awesome beauty benefits of lemon! Note: Lemons are photo-sensitive so don’t apply it on your skin then go out in the sun! Lemon is an incredibly powerful anti acne face mask ingredient. It’s got antiseptic and antibacterial properties that enable it to fight off and kill acne causing germs and bacteria both inside the body and outside the skin. Cleansing Lemon Drink: Drink a glass of filtered water mixed with freshly squeezed juice from 1/2 of a lemon and 1 tsp honey first thing in the morning to help clear off acne by cleansing your system. Lemon has a refreshing scent that represents cleanliness. Not only that, lemon has antibacterial, oil control and pore purifying properties that naturally cleanses skin from deep within. Face Cleanser: Squeeze 1/2 a lemon in 1/2 cup of purified water. Soak a clean cotton with this solution and use it to wipe off excess dead cells, sebum, dirt, grime and pollution. Close your eyes shut and use splash the remaining water on your face to tone. Do a final rinse with cold water. Pat dry with a soft towel. Being a natural astringent, lemons tighten and tone skin. When you apply diluted lemon to your skin, as it dries up, your skin starts tightening. This shrinks large pores on the skin’s surface and regulate sebum production, helping prevent oily skin, black heads, white heads and acne! Face Toner: In a spray bottle, pour 1/4 cup of distilled water. Now add 1 tsp of lemon juice. Close the bottle and shake well to combine. Mist this on your face with your eyes closed as a natural skin toner! It keeps for a week. The skin tightening effect of lemons is very useful when it comes to getting rid of blackheads. Lemons will tighten and dry out the skin around black heads, encouraging the black head to squeeze out naturally. Use a lemon juice brown sugar scrub to eliminate black heads. Simply mix up 1 teaspoon of brown sugar with 2 drops of fresh lemon juice. Scrub gently on your black head areas. Wait for it to dry up before rinsing off with warm water. Do this twice a week to see results. The astringent effects of lemon have oil control action that help reduce oily skin. Lemons tighten large pores and in the process shrink them so they will not be able to secrete excess sebum onto the skin’s surface. Apply equal parts fresh lemon juice mixed with filtered water onto your face to control sebum production. Though lemons are acidic in nature, when assimilated by the body, they have an alkalinic effect. This enables them to regulate the pH of the body and prevent build up of toxins and acidity. Lemon water is also a natural diuretic. It help flush out excess fluids and toxins. Drink lemon water first thing in the morning to clear your system and reduce fluid retention. Lemon has an alkalinic effect inside the body. It neutralizes the acidic internal body environment that is ideal for toxins and harmful substances. Lemons also balance the body’s pH and help flush out toxins before they erupt as pimples and acne on our skin. The best way to benefit from the body pH balancing effect of lemons is by drinking a glass of warm lemon water first thing in the morning. Women of the Italian Renaissance lightened their hair with just lemon juice!Be careful as lemons have natural bleaching properties, brought about by the high concentrations of citric acid, and can really lighten hair. Just like with oily skin, lemons get rid of an oily scalp by tightening the hair follicles. This checks over secretion of sebum onto the scalp and hair. Soak a cotton ball with lemon water and apply it all over your scalp. Make a lemon water hair rinse by squeezing one lemon into 2 cups of filtered water. Rinse your hair with this solution during a shower to reduce an oily scalp and greasy hair. Using lemons on hair not only control oiliness but also stimulate hair growth! Lemon has powerful antioxidants such as vitamin C and citric acid which have free radical fighting properties. Use a half a lemon to scrub your scalp. This stimulates hair growth by promoting proper blood circulation to each of your hair follicles. Mix a little lemon juice into your hair mask the next time you make one! Lemon has powerful anti aging properties that promotes youthful skin. It tightens and lift up skin, preventing sagging of cheeks. Lemons are rich in vitamin C which boosts collagen production, fights pro-aging free radicals and also tones the facial skin, maintaining its elasticity and tautness. 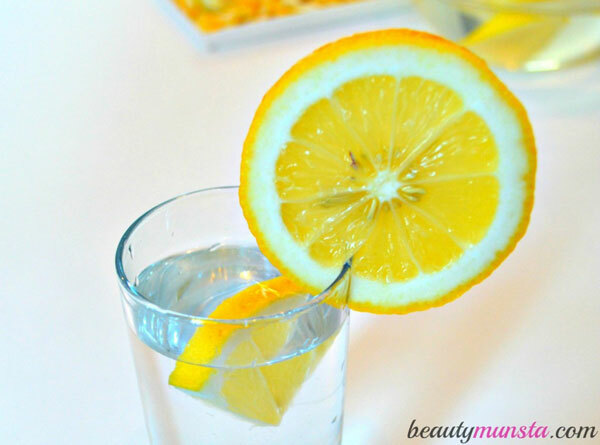 Spritz lemon water onto your face to tone and firm your skin. Citric acid, a potent alpha hydroxy acid found in lemons, is a natural bleaching agent. It visibly lightens your skin tone a few shades lighter. Simply soak a cotton ball in diluted lemon juice and apply it all over your face. Do this twice everyday to lighten skin. If you’re lightening dry skin, do this every other day to prevent over drying out. Lemons lightens not just your skin tone but acne scars and blemishes too! The natural bleaching agent of lemons – citric acid is at work here. Using a q-tip apply fresh lemon juice to your acne scars, blemishes, dark marks and pigmentation help fade them away. Do this consistently to help fasten the healing of the scars. The alpha hydroxy acids in lemon exfoliates skin by breaking the bonds between dead cells and the skin surface. Lemon scrounges off dead cells and flaky skin even from deep inside skin pores by dislodging dead cells trapped within. Use a lemon juice salt face scrub to gently scour off dead cells and grime from skin. Lemon has anti-fungal properties that eliminates scalp fungal infections including dandruff. Rub a half lemon onto your scalp before a shower to eliminate dandruff. Wait for 15 minutes for the lemon to work its magic. When the time is up, shower as you normally do, taking time to massage your scalp to remove the lemon flesh which may be sticking to your strands. Alternatively, try this Egg White and Lemon Hair Mask for Cleansing Hair & Dandruff Control! The anti bacterial properties in lemon kills off lingering mouth bacteria which give off a horrible odor. Lemon also has a refreshing scent which leaves your mouth fresh and clean! Some people rub their tongues with half lemons but all you really need is a tall glass of warm lemon water to neutralize bad mouth odor! Spritz lemon water on your hair strands to add a shine to dull damaged hair. 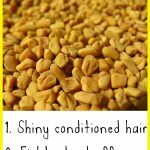 Limonene, is a compound in lemons which brings a natural shine to hair locks. A lemon water hair rinse helps achieve shiny locks. To make lemon water for hair, squeeze one lemon into one cup of filtered water. Store this in a spray bottle and spritz away! Lemons have exfoliating and cleansing properties which help purify your skin from deep within. 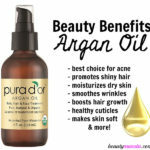 It helps dissolve dead cells and drive out grime, pollution, dirt, excess sebum and germs from deep within skin pores. Do facial steaming with lemon water (squeeze one lemon in 3 cups of steamy boiling water) to clear out gunk in clogged pores! Lemons are rich in anti-oxidants such as vitamin C and lutein which strengthens you nails and keep your cuticles moisturized. Lemons are also very useful when it comes to removing yellow nail stains. Use half of a lemon to scrub your hand and toe nails to make them bright and clean. Acne, blackheads, white heads, scars and pigmentation muddy skin complexion and make it look unsightly. Use lemons from the inside and out to promote glowing skin. Drinking lemon water regularly purges toxins from the blood stream which would other wise be excreted through the skin, through acne. 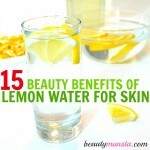 Applying lemon water to your skin brightens your complexion by clearing acne and lightening acne scars and blemishes. Come share your favorite beauty benefits of lemon in the comments below! 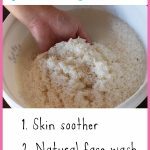 10 Beauty Benefits of Rice Water for Skin, Hair and More!